CFR: § 201.39 Notice to Libraries and Archives of Normal Commercial Exploitation or Availability at Reasonable Price. The Judge did not give the message that any copying which lessened the money which could be earned by the original characters was to be punished. “A criticism of the original work, which lessened its money value by showing that it was not worth seeing or hearing, could not give any right for infringement of copyright.” Thus, had the audience been made to question their interest in the originals rather than merely having their interest fulfilled, that version could meet the conditions necessary to be regarded as fair criticism. 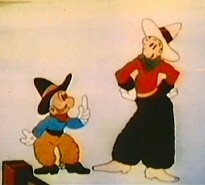 illustration: from one of the 1930s cartoon movies starring the genuine Mutt & Jeff. Without having been renewed, this cartoon has entered the public domain, as have the characters. Characters introduced as long ago as these are beyond the maximum age for copyrights taken out prior to modern editions of the Copyright Act. Uproar Co. vs National Broadcasting Co.
Uproar published entertainer Ed Wynn’s radio scripts through arrangement with Wynn, who owned them (implicitly) although such sale injured the implicit agreement between Wynn and his sponsor (The Texas Company, which sold gasoline) that Wynn not degrade or cheapen the value of the program. Wynn was paid $5000 when he provided the script for his program and $3500 when he did not, so that the court decided that $1500 was the value of a replacement script should the sponsor have to obtain one elsewhere. Given that the sponsor had a reasonable expectation that for $1500 the potential radio audience not be diminished because some would-be listeners came to realize that they could get the same jokes in print, Uproar could not contend that the “derivative version” it obtained served a noncompeting market. Northwestern Bell Telephone Company vs Bedco of Minnesota, Inc.
An injunction was granted against a company that photocopied Yellow Pages ads and inserted these in its solicitations to those same businesses to buy advertising space in the defendant’s competing directory. A substantial summary of this case is provided under fair use. What is pertinent here is that CBS made unauthorized use of a compilation of scenes from Charlie Chaplin films that had been broadcast in conjunction with Chaplin’s appearance at the Academy Awards in 1972. No one had the right to rebroadcast that compilation, yet “[m]any of the same highlights of Chaplin’s films which had been included in the Compilation were included in The Gentleman Tramp”, which had been authorized by the copyright owner of Chaplin’s films. Bert Schneider worked on both. CBS didn’t license The Gentleman Tramp (despite being approached by rbc to do so), yet broadcast on December 26, 1977, a half-hour program on Chaplin that incorporated most of the Compilation, which made up 40% of the CBS program. The decision against CBS was $7,280 for statutory copyright infringement (compensatory) for the feature films excerpted; $1 common-law copyright infringement on the Compilation (compensatory); $300,000 unfair competition (compensatory); $300,000 common-law copyright infringement (punitive) for CBS’s appropriation of the skill and labor that went into the Compilation; $110,000 unfair competition (punitive); and $5,000 statutory damages (award added by District Court judge, supplementing the other awards, which were determined by jury). The unfair competition awards were on the basis of New York state law. Some awards did not have to be paid given an “in lieu” prior arrangement, so just $410,000 was to be paid. CBS at that time earned the amount of the final payout roughly once every 16 hours. In creating its own yellow pages directory, Johnson Publishing used the listings of its established competitor as a resource when it sent solicitations to potential advertisers to take out ads. The Court ruled that using the existing white pages in the absence of Johnson’s own efforts was wrong. “Mere verification, without an independent canvass, does not mitigate the reliance on plaintiff’s work.” Thus, had Johnson canvassed on its own and obtained mere verification from Central Telephone, that would have been permissible. However, “ground of proof of copying of the defendant is the presence of fictitious listings inserted into plaintiff’s directory and later present in defendant’s directory.” The white pages were thus known to have been infringed. “Fred L. Worth… is the author and owner of all rights in two books on trivia entitled The Complete Unabridged Super Trivia Encyclopedia and The Complete Unabridged Super Trivia Encyclopedia, Volume II. Worth’s books are compilations of facts, alphabetically arranged under headings that are followed by explanations of the particular entry. Each book contains 6,000 entries. Worth allegedly derived information from books, films, and television shows after extensive research. The two volumes were first published in 1977 and 1981, respectively, and were registered in the copyright office in 1984… . “Worth alleges that Horn Abbot, Ltd, and its principals, the designers of the game Trivial Pursuit, and Selchow & Righter company, the marketer of the game, infringed the copyright in his books… Each edition of the game contains 6,000 questions and answers arranged on 1,000 cards. “Worth contends that 1,675 questions (27.9%) in the Genus edition were taken from [Vol. 1], 1,293 questions (21.6%) in the Silver Screen edition were taken from [vols. I and II], and 8282 questions (13.8%) in the Baby Boomer edition were taken from [I and II]… . “The original creators of the game, Chris Haney and Scott Abbot, do not deny consulting Worth’s books in the development of their board game… . “It is clear, then, that the use of the factual content in Worth’s books does not constitute infringement. [quote and citation omitted.] The verbatim repetition of certain words in order to use the nonprotectible facts is also noninfringing: the game cards’ repetition of certain words used by Worth to describe places, persons, and events constitutes ‘mere indispensable expression’ of particular facts or ideas. If we were to hold otherwise, we would, in effect extend copyright protection to the facts contained in Worth’s books… . Harper & Row vs Nation Enterprises (launch this) decided on whether there was “fair use” when material gleaned from President Gerald Ford’s at-the-time unpublished memoirs was published in a magazine without authorization, but also dealt with financial liability of the magazine. Lone Ranger vs O. C. Cox, doing business as Wallace Brothers Circus, and Allen King (launch this) was a dispute over the rights of an actor to publicize his having played the Lone Ranger. Nancy Sinatra vs Goodyear Tire & Rubber Co., and Young & Rubicam, Inc. (launch this) was the singer objecting to an advertiser which evoked her public image without her authorization. RCA Manufacturing Company, Inc. vs Paul Whiteman, et al (launch this) looked at the possibility of a popular band losing engagements in public and on radio when the band faces competition from their own recordings played on radio. Walt Disney Productions vs Souvaine Selective Pictures (launch this) had two competing feature-film versions of Alice in Wonderland premiering just days apart.